Steeped in history and mythology, Athens is a complex beast. Many visitors simply use it as a stopover point on the way to the more romantic, alluring islands. Perhaps because of these short, hurried stays, Athens gets a bit of a bad rap. The architecture can’t rival that of Rome or Barcelona, the people can be gruff, and the economic crisis has taken its toll. But Athens has so much to offer and deserves some love. So here are some highlights that might just convince you to visit. The Benaki Museum of Islamic Art: nestled on the edge of the Kerameikos neighborhood sits my favorite museum in Athens. 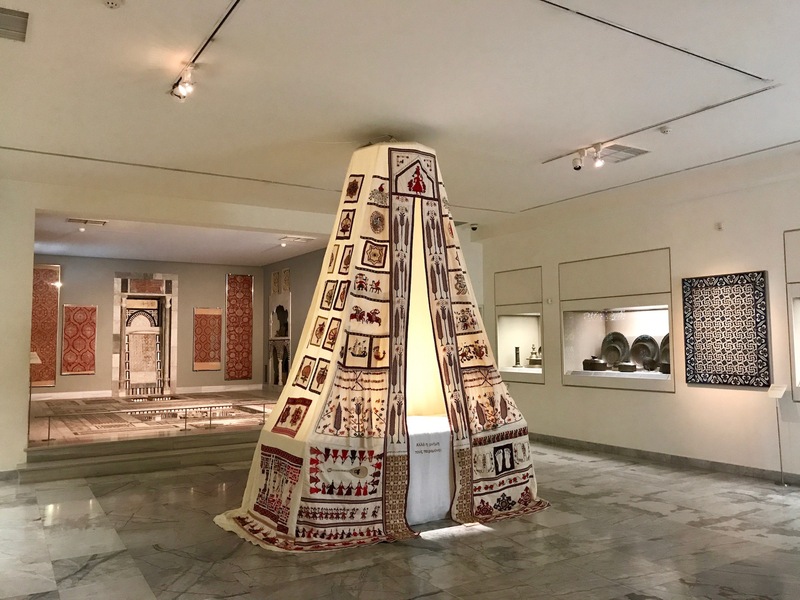 The small but robust collection works its way from roughly the 7th century to the 18th century and showcases incredibly colorful, complex works of art and culture. The Acropolis museum: almost 2,500 years ago, Pericles oversaw an ambitious building program atop the rocky, jutting Acropolis. Almost 10 years ago, the Greeks finally built a museum worthy of such a group of monuments. The “new” Acropolis museum is a dramatic, inviting masterpiece of modern museum architecture containing some of Athens’ most famous treasures and built to house many more. The Goulandris Museum of Cycladic Art: set in upscale Kolonaki in an elegant neoclassical building surrounded by lush gardens, this jam-packed museum contains both ancient Cycladic art and modern exhibits. The Ancient Agora: although it may not look like much these days, the agora was the hub of ancient Athens. 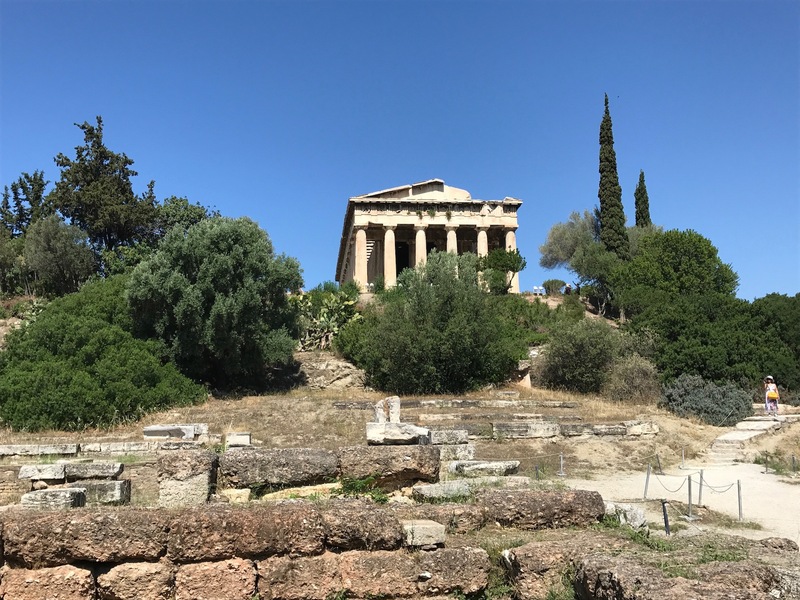 Visitors get an inkling of its former grandeur thanks to the reconstructed Stoa of Attalos, and the well-preserved temple of Hephaistus alone justifies buying a ticket. Various metro stations and buildings throughout Athens: one of my favorite aspects of modern Athens is the acknowledgement and preservation of the past. Pay attention when walking through the metro stations or into various museums and shops and you’ll often see old stone walls beneath plexi-glass floors. Cinque Wine and Deli Bar: tucked down a small, unremarkable street in the Psirri neighborhood, this tiny wine bar pours dozens of wines by the glass – many of them Greek – and offers a large selection of fresh, light nibbles. The owner, Eva, became one of our favorite people we met – she and her wine bar are true gems. 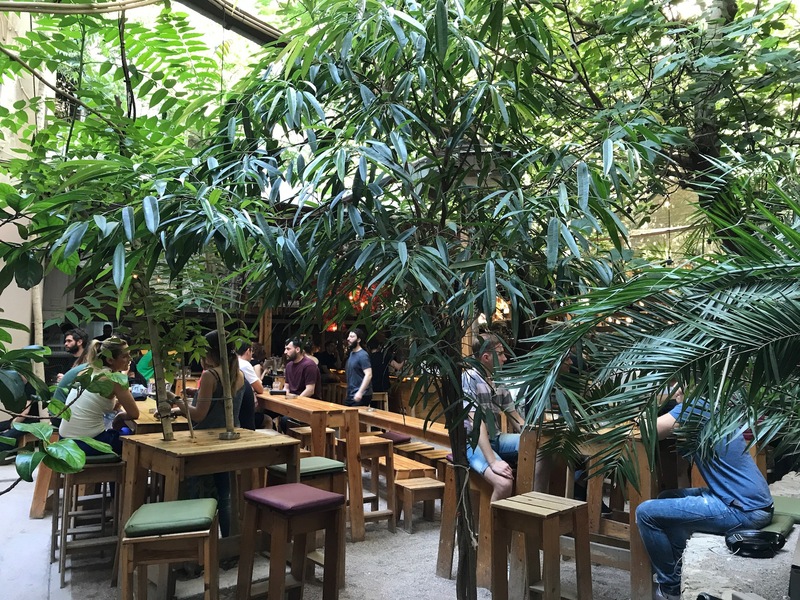 Six D.O.G.S: the bar and its entrance are hidden between shops, but head down the steps and you’ll emerge into a little oasis of big, leafy trees and scattered wooden tables. 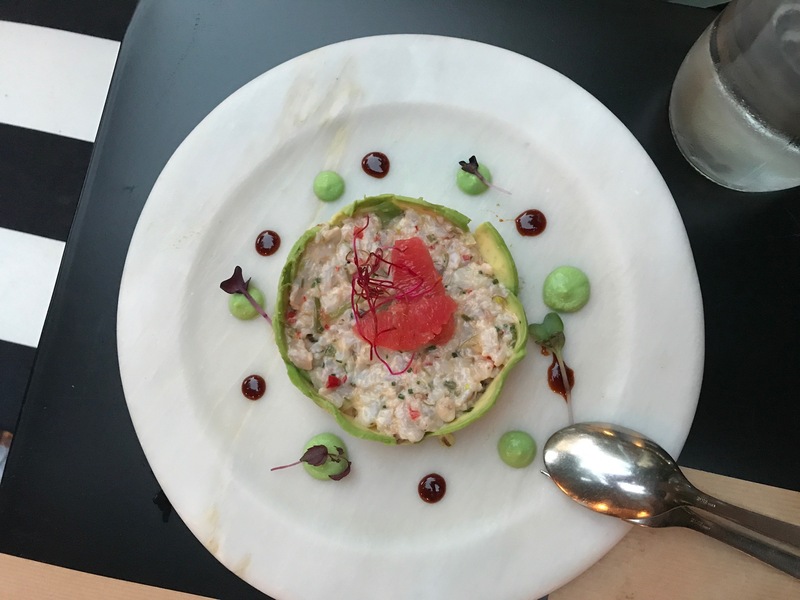 The cocktail menu is legendary and unique, the food is eclectic, and the atmosphere contains a hint of magic. Dinner in the Sky: if you want to have an epic dining experience unlike any other, choose Dinner in the Sky. The views are unbeatable, the food is delightful, and it’s well worth the cost. Wine flows freely and it’s impossible not to make friends with your table mates. Elvis Souvlaki: a tasty, simple meal for $1.75 around the corner from our apartment in Kerameikos? Yes, please! This little souvlaki stand serves up excellent grilled meat with fries for less than the price of a Heineken. Ultra casual and perfect for a quick bite. A Little Taste of Home: Ahmed came to Greece after marrying a Greek woman, but couldn’t find any work in the height of the financial crisis. After trying his hand at camel training, rug selling, bread running and a handful of other odd jobs, he was finally able to save enough money to open his restaurant. He says that everyone is always missing home, but the restaurant can be your home while you’re there. A mix of Syrian, Turkish, Asian, Greek, and Mediterranean food and the cozy, softly lit courtyard deliver on that promise. Malconi’s Italian Restaurant: one of the newer, trendier establishments in Kolonaki offering a large, varied menu, extensive wine list, and exciting cocktails. The modern, casual-elegant decor and black and white stripe cushioned outdoor benches welcome diners for an al-fresco meal. Noël Bar: a Christmas-themed bar may sound garish, but the gaudy décor manages to be both welcoming and entertaining without seeming over the top. An inventive cocktail list meets light, simple food in this festive setting. Hiking Lykavittos hill: I’ll just go ahead and say it: the climb is kind of rough. The zig-zagging path heads straight up the mini-mountain and feels like a frying pan in the summer. But it’s totally worth it for the stellar views of Athens awaiting you at the top. 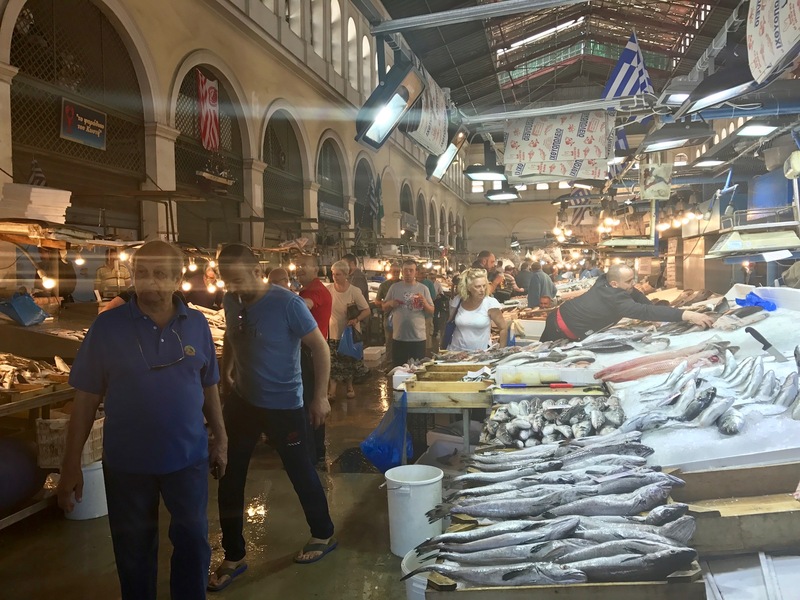 The Varvakios meat and fish market: Don’t step inside this market if the sight of calf’s head makes you squeamish. Whole animals, marine and land-based, lie ready to be wrapped up and brought home, and butchers wield huge machetes deftly and constantly. But if you love to select your dinner right off the ice, this is the place for you. Shopping at a laïki agora: the smell of the freshest fruits and veggies surrounds you as you stroll between colorful umbrellas and even more brightly colored displays. But don’t stroll too casually, however, as you’re bound to get sucked in by a persuasive farmer hawking her delectable wares. These fresh markets are set up weekly at various locations throughout the city. 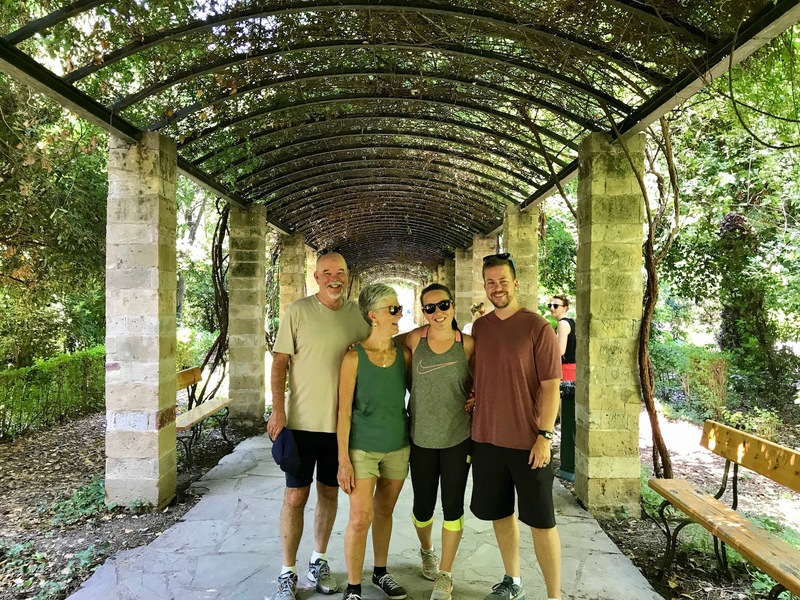 Exploring the National Gardens: right next to Syntagma square in the center of Athens, you’ll find a large garden laced with a shaded network of paths. Huge trees line the walkways, flowers bloom everywhere, perfuming the air, and bird calls flit through the branches above your head. A great place to walk, jog, or just relax with a book.